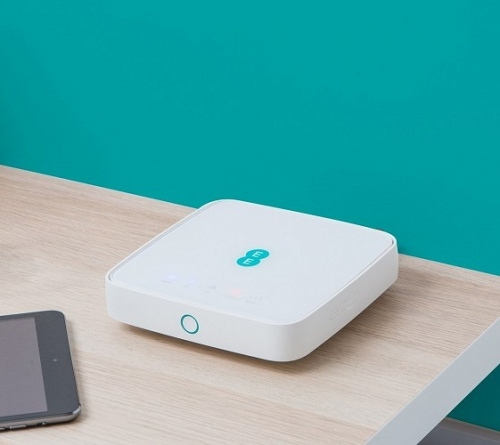 Mobile operator EE has today launched a new LTE-Advanced Category 7 capable 4G+ Home Router, which can theoretically handle Mobile Broadband speeds of up to 300Mbps and it can be taken with a huge monthly data allowance of up to 200GB per month. But the top allowance doesn’t come cheap. The 4G router (sized 146*146*32mm) is able to connect up to 32 devices via WiFi to EE‘s 4G network and it promises “real world download speeds” of up to 90Mbps, although the device itself is based off Qualcomm’s MDM9240 platform and can theoretically handle LTE Category 7 performance (i.e. up to 300Mbps download and 100Mbps upload) via Carrier Aggregation (using two radio spectrum bands at once – 2 x 20MHz download and 2 x 20MHz upload). At present the operator’s “superfast” 4G network covers 83% of the United Kingdom’s landmass (equal to more than 99% of the UK population) and they have an ambition to extend this to 95% geographic coverage by 2020. The focus on areas with slow fixed line connectivity is a key point of the new promotion. Traditionally mobile operators have struggled to offer a viable alternative to fixed lines because of their expensive and limited data caps, as well as other issues with network restrictions, service quality and coverage. However, as coverage improves, EE also appear to be targeting the issue of data usage and as such they’re now offering plans that go up to 200GB (GigaBytes) per month on an 18 month contract (see the plans). The downside is that these aren’t exactly cheap but they’re getting a lot better and more competitive. Alternatively customers can purchase the device on pay-as-you-go for an upfront cost of £129.99 with 10GB pre-loaded data. When will they be updating their Brightbox 2 router? It has been a while now. That’s for their fixed line service and thus a different product entirely. Sadly the answer is we don’t know but I’d expect a change if they launch a G.fast product in the near future. A good start. At least more options are available now. It seems to be a response to Three’s Homefi. Cut the prices by 50% and quite a few people would consider it as a fixed line replacement. But their network probably couldn’t handle the traffic at the moment. To give a bit of context, the average UK Broadband User takes about 150GB of data each month on a line that probably costs around £30 – 40, so £100 for 200G looks very expensive. There is also the question of coverage. I’m (unfortunately) on EE for mobile and often have to go outside the house just to make a call (and that’s in a town close to London). I’ll stick with a landline for BB. Get an XPOL antenna and stick it on your TV antenna pole or on side of house high up, before antenna I got no 4G, now I get 3/4 bars. Good to see higher usage becoming available. Shame the price is a bit too high with a long contract. The Three offering (40GB per month for £24 over 4G) seems far more reasonable at the moment. But good on EE for offering a faster 4G+ faster technology option. While price per GB is very good with Three I can’t say the quality of service would be. However I suppose if EE has an area that’s lacked any upgrades for some time then maybe Three could match performance but honestly I spent 2 months with Three earlier this year and lived with someone for 2 years who was on Three and it was a terrible experience for both of us almost anywhere in the country we went. Also been an EE customer and Virgin Mobile 4G customer, also tested ASDA’s 4G Data and very good indeed. Been excellent for me, 60Mbps down, 30Mbps up, sub-50ms ping, down time is rare (usually during night). That 99% of population coverage statistic relates to outdoor coverage. I doubt if the router is weatherproof. Can you get a outside aerial for this modem ?? If it has standard SMA connectors it shouldn’t be a problem. Well, My phone has a cat 7 LTE Modem and it can and does do 250mbps + all day long. So I am sure this device can too. I might even drop my data plan down (which I use as a in car hotspot everyday) and get this instead ! Seriously tempted by this. Does anybody have any information on the LAN ports? Also, EE advertises that this will take an external antenna. Does anybody have a recommendation? Says it has antenna ports and by the looks of it just 1 LAN port, not sure if gigabit though. Three are offering 100gb for £30 now. Call them up or visit a store for the offer, it will be rolled out nationwide soon. Three HomeFi – £24 for 40 GB, “around £30” for 100 GB was what I was told in web chat, and given phone number 08000 338001 but queue was quite long and I didn’t stick around to find out exactly how much the 100 GB/month costs. Add £60 if you go for 1 month rolling contract. Box is ‘included’ when you take the 12 month contract, on 40 GB (as shown on website), and presumably also on the 100 GB option. I started by asking if there are plans to offer 250 GB and 500 GB options to be better than EE but guy in chat would only point to 100 GB and say ask again in a few months. Data limits are the cash cow. Minorities are typically scapegoated when one has ulterior motives. Great to see another option for home style 4g broadband, in our home only Vodafone can get a signal through the walls on band 20 at surprisingly fast speeds 50mbps which with a landlines speed of less than 1.5maps is amazing, at the time about 6 months ago I had to get a huewai 4g router and currently use 2x50gb sims at £30 per 50gb. If you have a poor copper line connection and great 4g I would definitely recommend something like this. I would have to agree with Neil. We have dreadfully poor Broadband speeds via ADSL (too far from the cabinet to receive Fibre, although the cabinet is enabled). Have children that don’t understand what ‘Please Wait’ and a spinning circle mean without tearing down the house. Have been fighting with BT for the last 4 years to determine whether we were going to get fibre and gave up. Went to 3 signed up for a Monthly plan with a tethering allowance for a small monthly cost, now have 6Mbps fixed broadband (ADSL) and ahem, 85Mbps 4G which I share from the 3 Mobile phone when Internet activity and streaming is high in the house, have never looked back and have a happy family again! If it was unlimited data usage and around £50-£60 per month I would take it up as I’m currently stuck on a 2Mb ADSL connection in a new build. On top of a hill and not too far from a transmitter so get a great Vodafone 4G signal. Hopefully this generates some competition in this area. Does anyone know if the sim for this can be used in another router/mobile phone? I have a current set up where I have a 4g aerial on the roof connected to a Samsung S4 for Three. I was thinking about swapping over the sim for EE. I suppose I could change the connectors to SMA instead if I needed to.